-Breastfeeding nurtures young community members to grow to their optimal potential. Breastfeeding reduces the risk for illness throughout the lifespan, costing the community less tax dollars and medical bills. -Percentage of infant illnesses requiring one day of maternal absence from work: 75% of formula-feeding mothers as compared to 25% of breastfeeding mother absences. Higher retention rates for businesses who offer lactation support. $240,000 savings in healthcare expenses for one company due to breastfeeding protective factors. - Since doctor’s work for optimal health, encouraging breastfeeding follows from this goal. For every 1,000 babies not breastfed, there were 2033 more doctor visits. Breast milk protects babies from many diseases and illnesses during infancy and throughout the lifespan. Doctors are acting in line with their ethical code when they promote and encourage breastfeeding. -Breastfeeding your baby encourages mother-infant bonding through the release of hormones during the close skin-to-skin contact. Breastfeeding reduces maternal risk for diabetes, breast and ovarian cancer. Breastfeeding requires an additional 500 calories a day, helping mothers lose their pregnancy weight. Breast milk also provides a wealth of nutritional and health benefits for the child. -Breast milk protects against a variety of illnesses and diseases throughout the lifespan, including high blood-pressure, high cholesterol, cancer, diabetes and obesity. Breast milk coats the infant’s digestive tract, preventing pathogens from entering the child’s body. Breast milk provides antibodies that protect the child from diseases in their immediate environment. Breastfeeding reduces the risk of Sudden Infant Death Syndrome (SIDS) and allows children to learn self-control and autonomy over their food-intake. 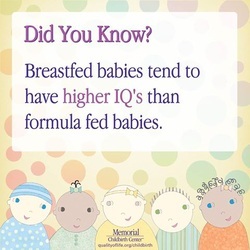 A breastfed infant is less likely to develop allergies or depression, and is less likely to become a picky eater.